When the world was young and unsullied, we did wholesome things, like laugh at Cheezburger memes and other cat-related pleasantries. One treasure we all adored was the Double Rainbow video, in which a man—ostensibly on peyote and beaver tranquilizers—nearly orgasms at the site of two rainbows in the sky. Those halcyon days may be over, but now, we have a double star system to enjoy instead. On March 6th, the European Southern Observatory (ESO) posted a mesmerizing image of a binary star system, captured by the agency’s Atacama Large Millimeter/submillimeter Array (ALMA). The swirling, false color radio emissions image shows LL Pegasi—a star located 3,000 light-years from the Sun—getting along nicely with its binary companion. As the old red giant LL Pegasi orbits its companion, it loses material, and as a result of its highly elliptical path, it leaves behind a spiral shape. 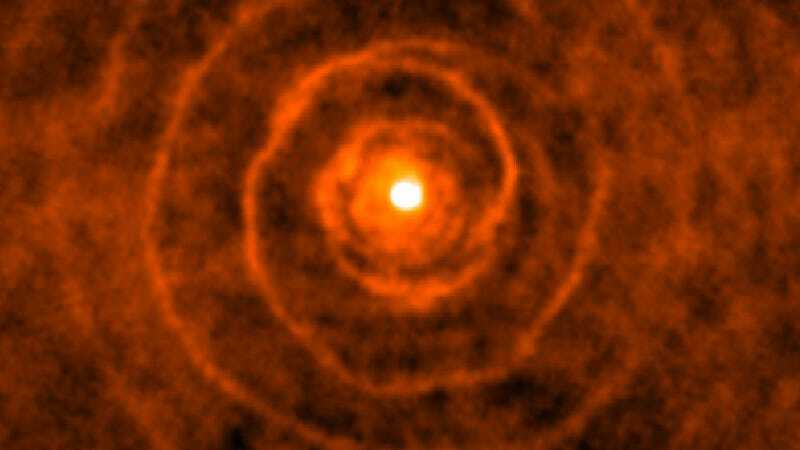 Each “layer” in the spiral is thought to represent about 800 years, which is the estimated orbital period of the binary system, according to Hubble. The new observations have been published in the March issue of Nature Astronomy. “Because of the orbital motion of the mass-losing red giant, the cold molecular gas constituting the wind from that star is being spun out like the sprays of water from a rotating garden sprinkler, forming the outflowing pattern of spiral shells,” UCLA astronomer and study co-author Mark Morris explained in a statement. At some point in this cosmic love affair, LL Pegasi will become a nebula. Until then, we’ll have many more years of this freakishly beautiful swirl.